Beef and rice - can't get more basic than that. 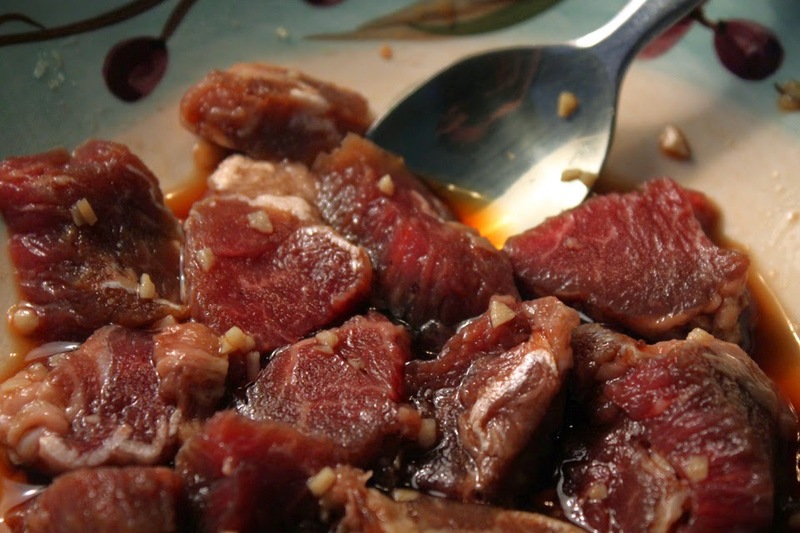 Just saute a 3ounce slab of marinated and sliced ribe-eye, then wrap it up in a few balls of sticky rice. That's what makes up a typical Beef Onigiri Japanese recipe. 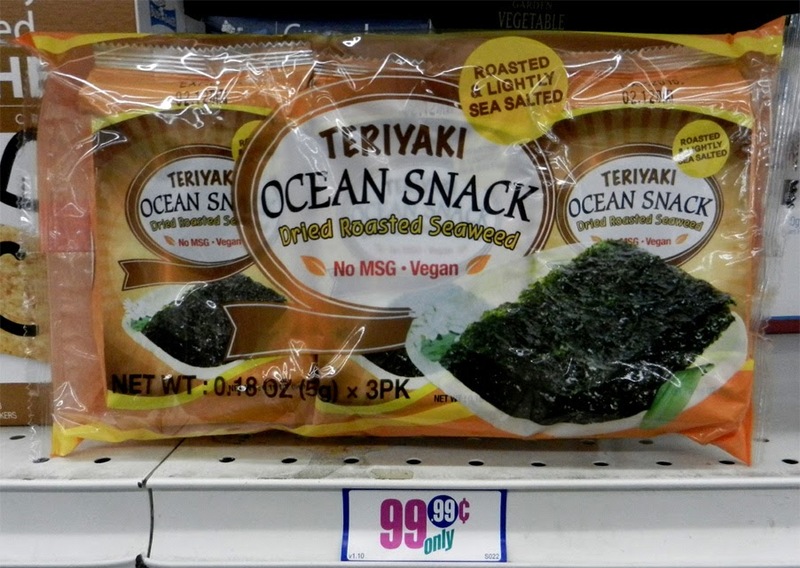 You can add a small sheet of dried seaweed snack (becoming more popular and even sold at regular groceries) for an extra salty kick. And I picked up all these ingredients at my local 99c only Store! How's that for a unique cheap$kate meal? Hang out with The 99 Cent Chef and you can live high on the hoof - so read on and I'll give you the Beef Onigiri recipe: presented with yummy photos, GIFS, and a video. There's not much to it, really. 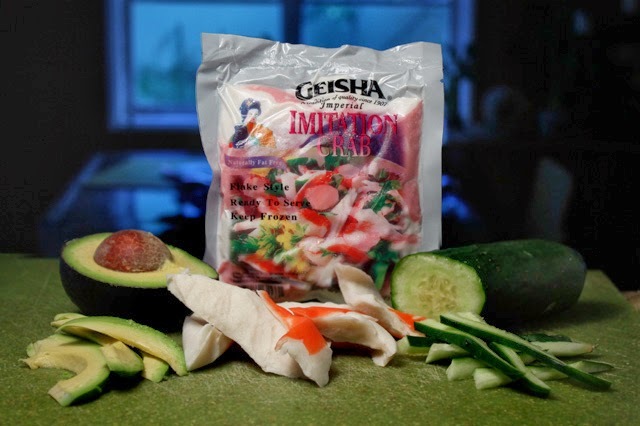 Just click here to see my sticky Sushi Rice recipe - that's the only atypical ingredient, but even that is a cinch to make when you follow my unique stop motion video instructions. 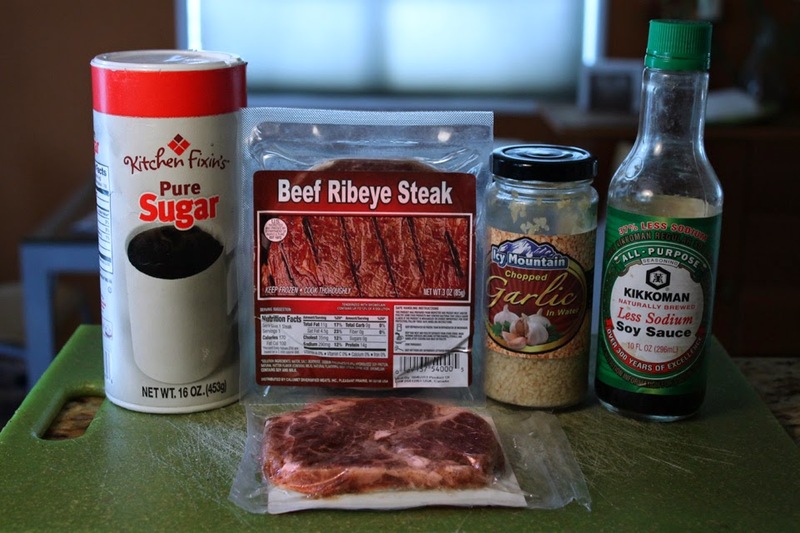 As for steak, well, I get a single serving and marinate it in soy sauce, sugar and a little garlic. That's a lot of flavor. I like working with these cheap small 3 ounce packages of rib-eye. It's my favorite cut of beef because you get that large center piece of sirloin, and a marbled strip of super-tender loin along the edge - the best of both worlds. Japanese Onigiri is fast food from the East. It's portable and filling. You can wrap almost any favorite veggie or cooked protein in sticky rice. Check out my Salmon Salad Onigiri recipe from last month, here, to see what I mean. Sticky rice is messy to handle, so use a sheet of plastic wrap. My video leaves this part out: I made the rice ball the traditional way of using my hands, moistened with a little water. However most chefs now use plastic wrap to press and form the Onigiri. 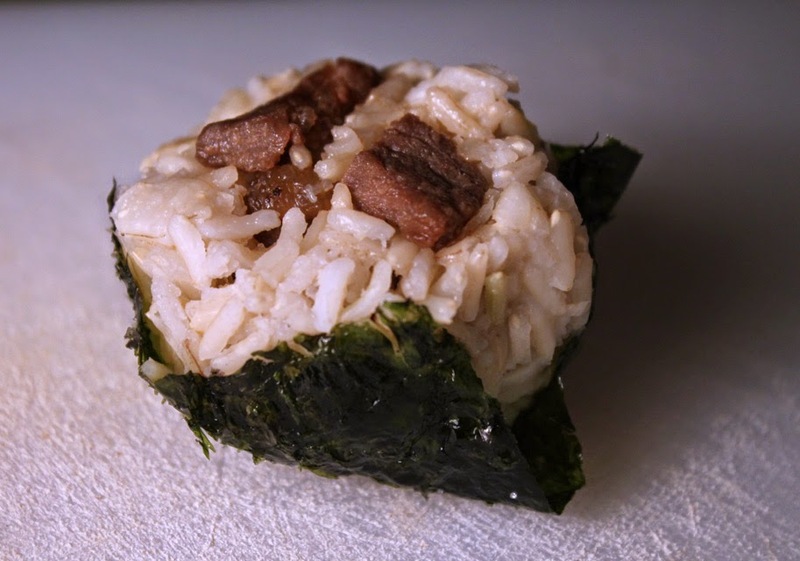 You can present the Beef Onigiri plainly or wrap it with a sheet of dried seaweed snack. 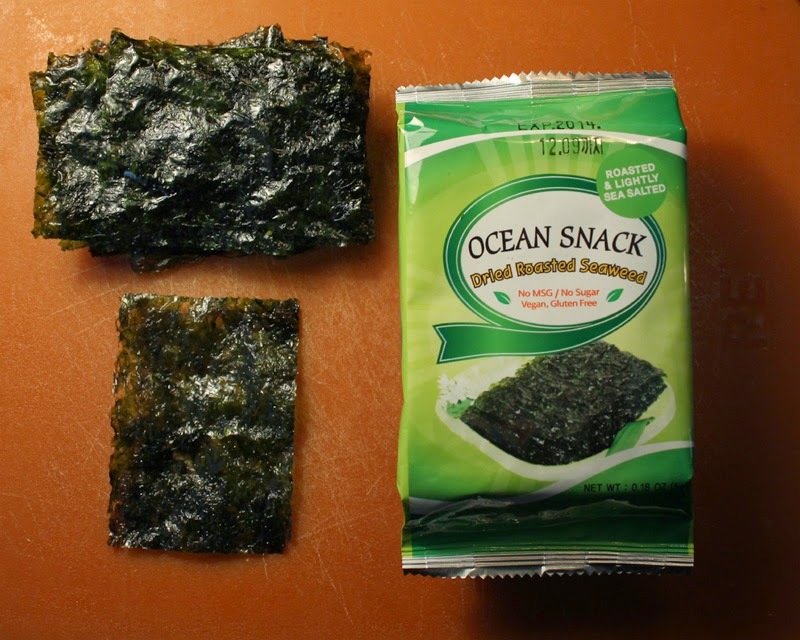 You can get packages of dried seaweed snacks almost anywhere now, and what's so great about them is they are pre-cut to a perfect size. My Beef Onigiri recipe makes about 4 rice balls, and it's easy enough to double the recipe. So give it a go - it's a perfectly delicious small bite. 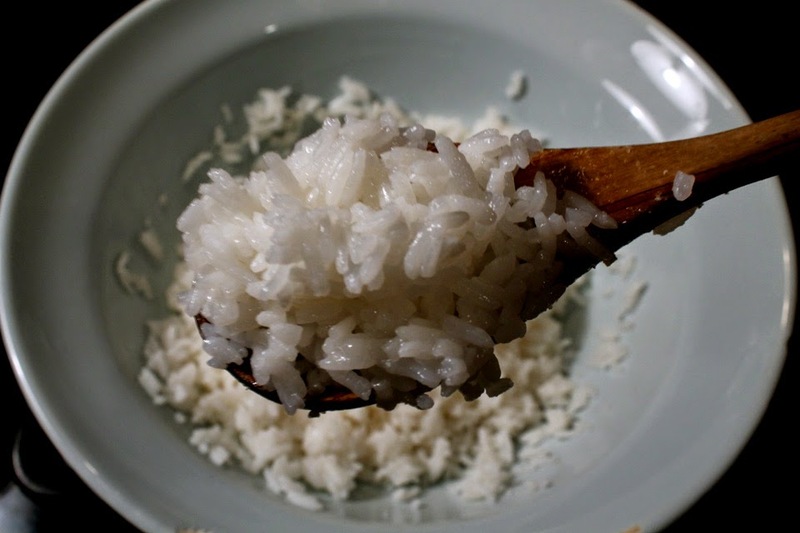 1 cup brown or white rice - use my Sushi Rice recipe. Click here to see the video. 3 ounces of steak - I used a small rib-eye steak. You can use sirloin or any tender cut of beef, even ground meat like: beef, chicken or turkey. 1 tablespoon soy sauce - I used low sodium. 1/2 teaspoon sugar - or a favorite sweetener, that can be sauteed with the meat. Okay to add more to taste. 1/2 teaspoon garlic - chopped. Okay to use garlic powder or dried garlic. 1 teaspoon oil - for sauteing meat. Dried seaweed - optional. I used pre-cut (about 2 by 4 inch) dried seaweed snacks. 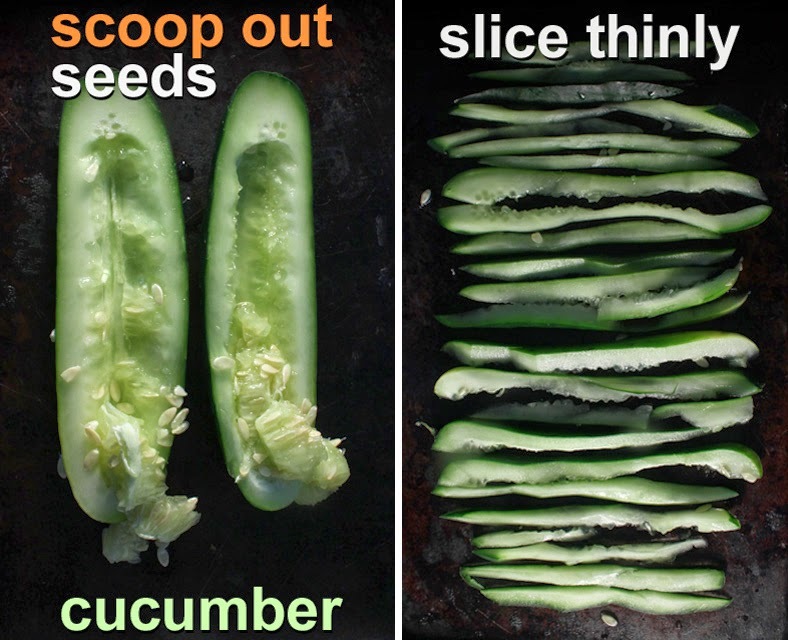 Okay to use any size really, just cut them with scissors. Prepare sushi rice according to my directions here (or use your favorite recipe.) 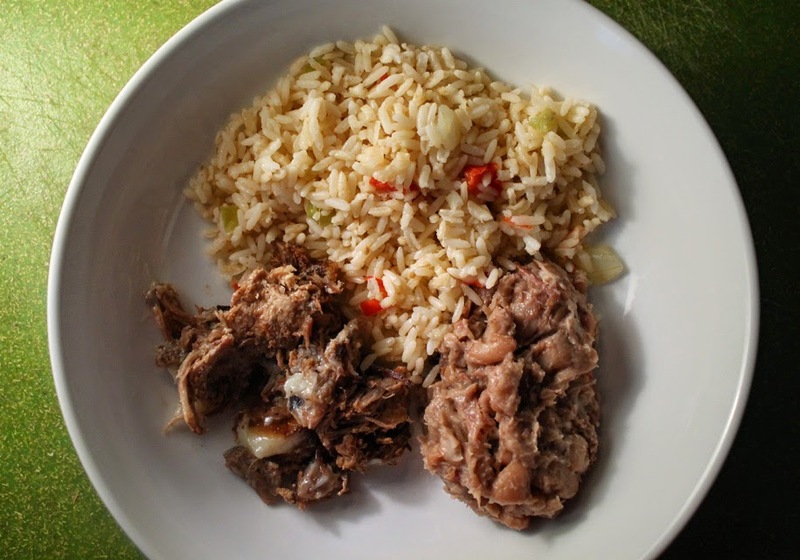 Allow cooked rice to reach room temperature. Chop steak into small bite-sized pieces. Add marinade of soy sauce, sugar and garlic. Mix well and set aside for 5 to 15 minutes. 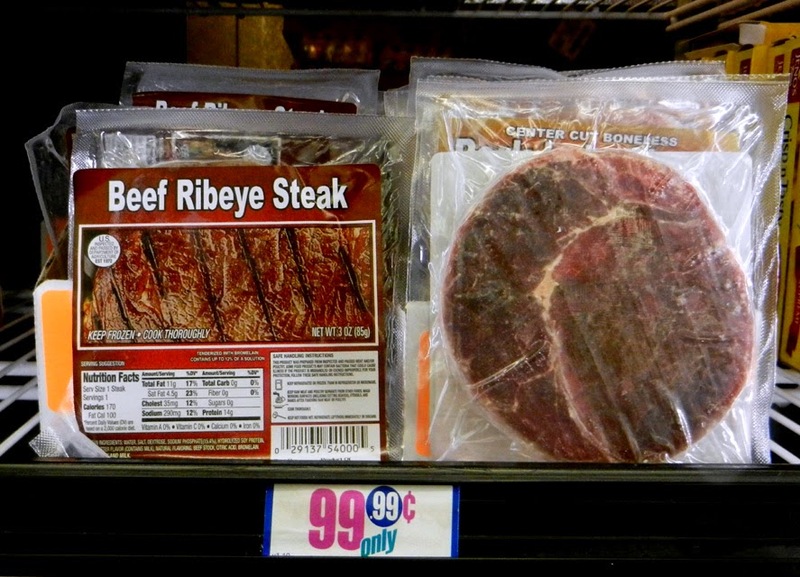 If steak marinades longer, then store in refrigerator. In a frying pan, over medium heat, add 1 teaspoon oil. Saute marinated beef until done, about 2-3 minutes. Drain and remove meat when done. Allow to cool down a couple of minutes. In the video above I formed the rice ball with my dampened hands. But it's cleaner and easier to use a sheet of plastic wrap. For assembly, place the sheet of plastic wrap on a dry surface. Pile on about half a cup of cooked rice in the middle of plastic sheet. Press into the middle of rice mound to make space for the cooked steak. Add about a tablespoon of steak. Add just enough rice on top of steak pieces to cover (optional - okay to leave steak exposed.) Pick up the four corners of plastic to start forming a ball. Now you can close up the rice ball with plastic wrap. Lightly roll and squeeze the ball. You can keep it round; flatten one side; or form a traditional triangle shape. It's okay eat the rice ball right out of the plastic wrap, or make a few Beef Onigiri and serve on a plate. For extra flavor, use a piece of dried seaweed and partially wrap the Onigiri. The piece of seaweed gives you a dry surface to hold, for easier eating. This recipe is easy to increase. Just double the ingredients list to make twice as much. Use cheaper ground meat like beef, chicken or turkey - just mix in the marinade and saute until cooked through. Any chopped meat is okay including: beef, pork, chicken, even flaked, cooked fish. You could also stuff rice balls with canned (drained) tuna, salmon, chicken or turkey. Okay to substitute meat with chopped veggies (steamed and/or raw) and cooked mushrooms. 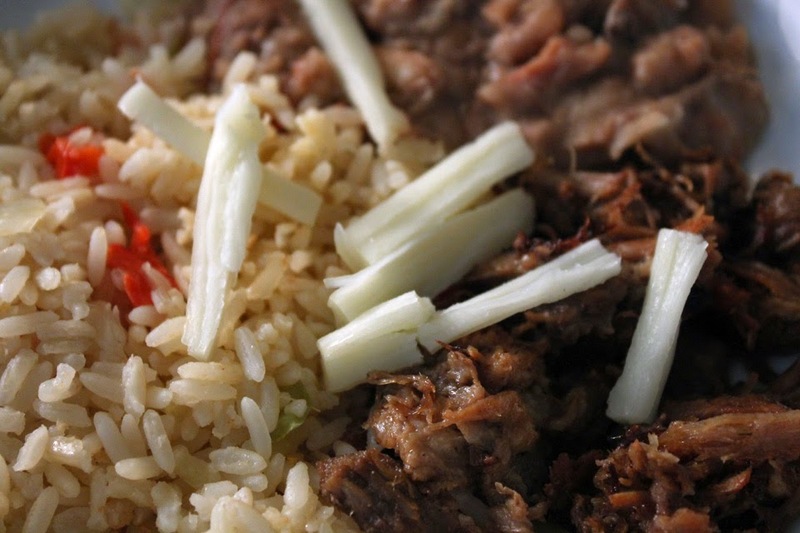 Cooked beef can be on top of rice ball -- meat can be exposed, or covered with rice. What to do with leftovers? For this new series I'll give you some edible ideas. First up is a loaded Carnitas Bowl. You've come to the right web address to see many of my Mexican meals all brought together in one blog post with plenty of tasty recipe links. I threw a party for a friend leaving Los Angeles for South Carolina. I gave him a choice from my cheap$kate repertoire of recipes, and he chose tender, slow-cooked, pork Carnitas Tacos. So, where he's going, that makes sense - good Mexican food is few and far between, there. 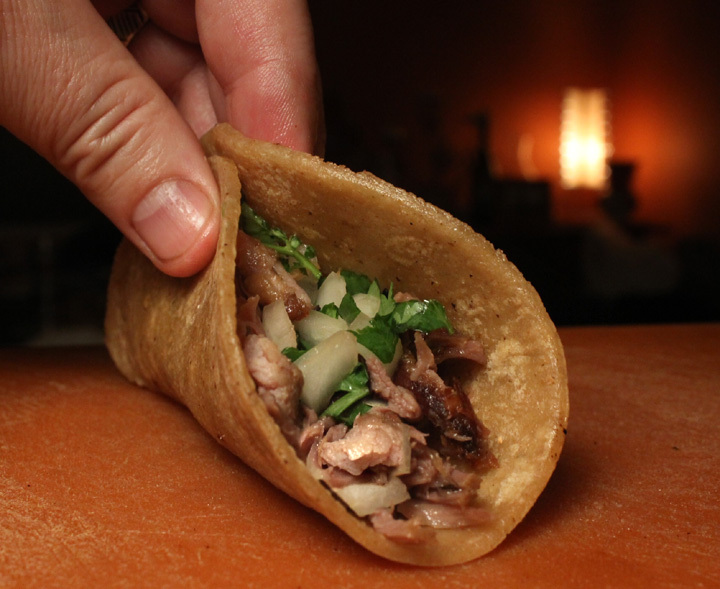 And I have to modestly say that my Carnitas recipe is one of my best. I also made pinto beans, Mexican rice, calabasitas, plus fresh red chile and green tomatillo salsas. The party and food was a hit. One of my guest, Ellen Bloom, is a talented local blogger and she wrote all about it - just click here. Carnitas is a one pot meal (plus a frying pan to chrisp it up) of slow-braised pork shoulder cooked in Mexican cola, orange and lemon juice, onion, garlic, with bay leaf and dried oregano. Once the liquid starts to simmer, just walk away for a few hours until the pork is fall-apart tender. Simple to do and so succulent - it's my favorite protein from a taco truck or taqueria. My recipe, with a video, is a click away, here. Pork shoulder is the cheapest pork, so I use it often. 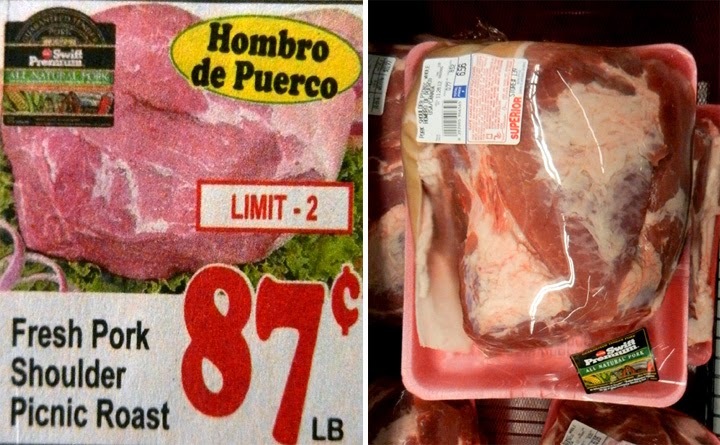 It's especially cheap at Latin markets, like these. I could have stopped at Carnitas Tacos, but for a party you gotta have some variety, so I added beans and rice. Put a pot of beans on and the kitchen will draw guest, from the tantalizing smell of my slow cooked beans recipe (click here.) The recipe link is for Black-eyed Peas, but it simple enough to substitute pinto beans; you just need to cook them an hour or two more to fully tenderize. (Black-eyed peas cook quicker than pinto beans.) For a vegetarian bean recipe (that uses red beans, so the cooking time is about the same) read my recipe and watch the video, here. I used my Mom's recipe, here, for Mexican Rice. Plus I made a trio of salsas: chunky Pico de Gallo, Red Chile, and a green Roasted Tomatillo. Click on any salsa name to see the recipes. 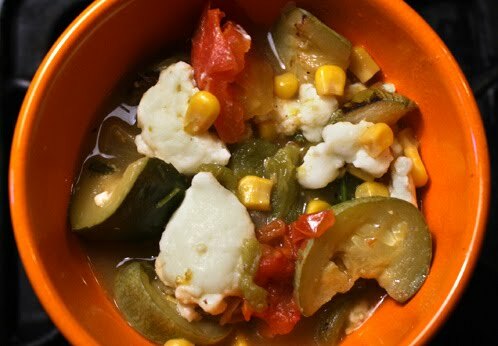 I finally made a veggie stew called Calabsitas (click here) with squash, corn, onion, zucchini, tomato and Mexican cheese. I went down so well that very little was left over. It was too much of a delicious party and I had plenty of leftovers. So after a few days of Carnitas Tacos, to change it up, I started making Carnitas Bowls. I first chop up some tomato, onion and cilantro. I had some extra cheese so i shredded a little bit. 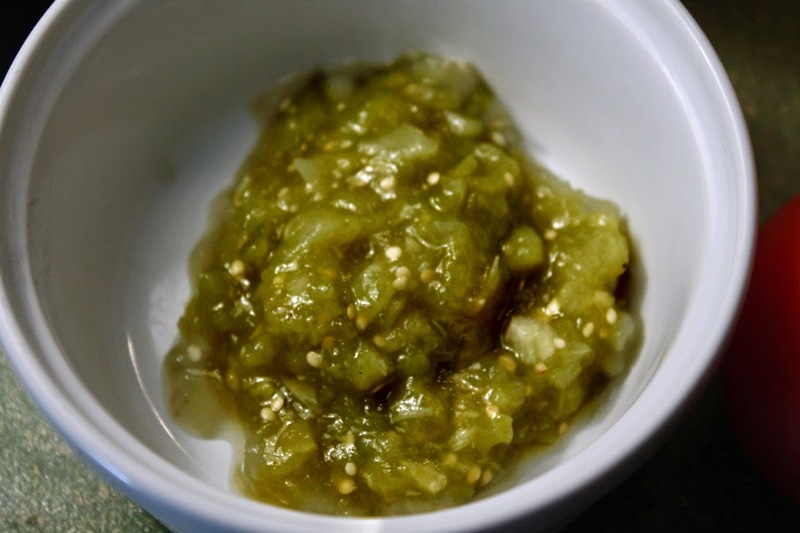 I took out some of my homemade Tomatillo Salsa, too. 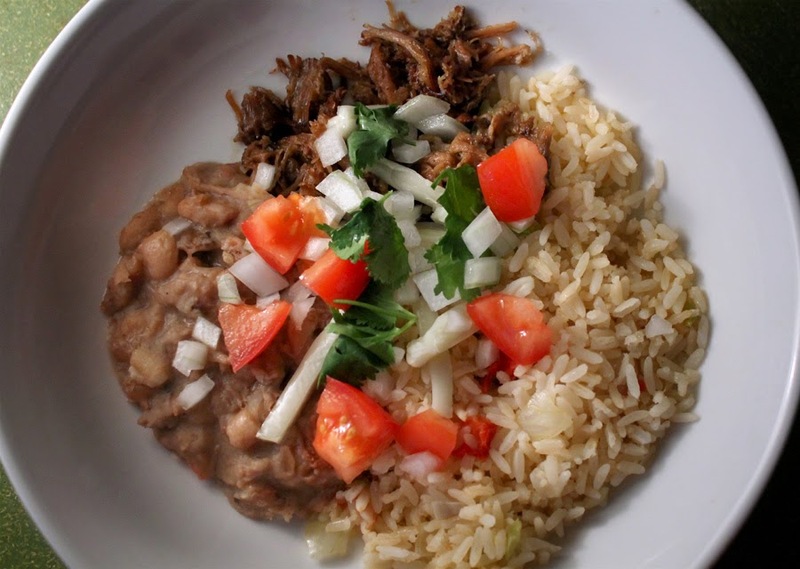 In a large bowl I added the leftovers that needed microwaving: beans, rice and carnitas. I stored the carnitas with some of the marinade it was cooked in, so the meat stayed moist when heated. The heated sauce also flavored the Mexican rice - so if you make my Carnitas recipe make sure to reserve plenty of flavorful cooked marinade. After microwaving, for final assembly, I first added the cheese so it would soften from the heat. Next, I topped the bowl with the chopped tomato, onion and cilantro. And finally I spooned on some salsa. It was so good. Over the next couple of days, the Carnitas Bowls lost a few ingredients as they were used up. But that's okay, each bowl was unique and all of them were delish. 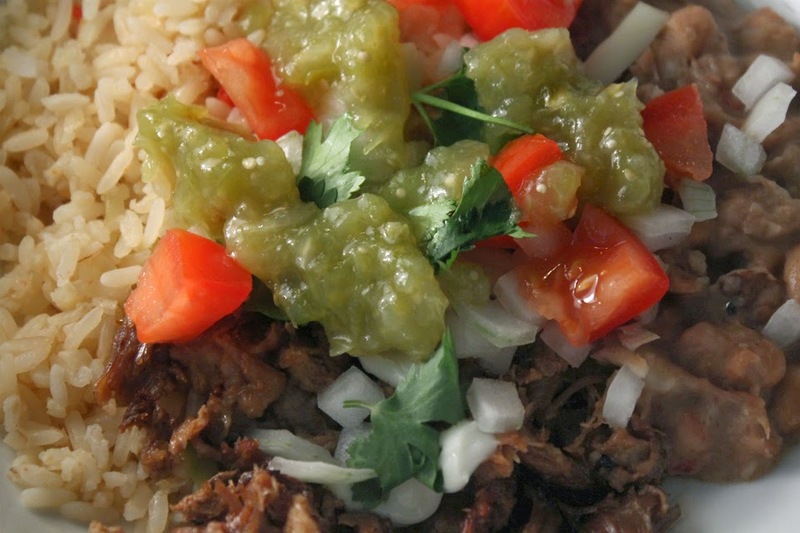 My Carnitas Bowl is adaptable so make it your own. Add as much of the particular ingredients you like to balance the flavors in your favor. 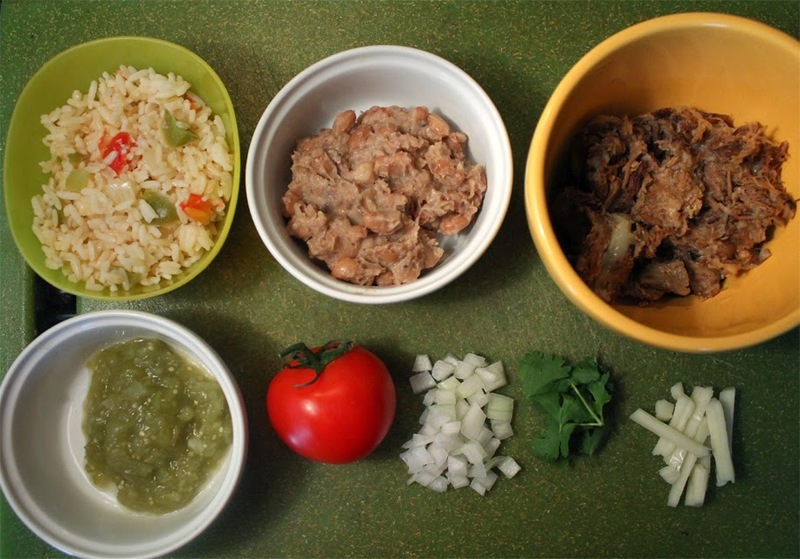 Do try out my carnitas, beans and rice recipes and throw your own taco party. And make plenty so you can have leftovers to reward yourself with a tasty Carnitas Bowl. Cheap$kate dreams are made of these: krab, mayo, hot sauce, sushi rice, and a sheet of dried seaweed , form a Spicy Krab Roll. I like it that way, and you will too, if you give it a try. 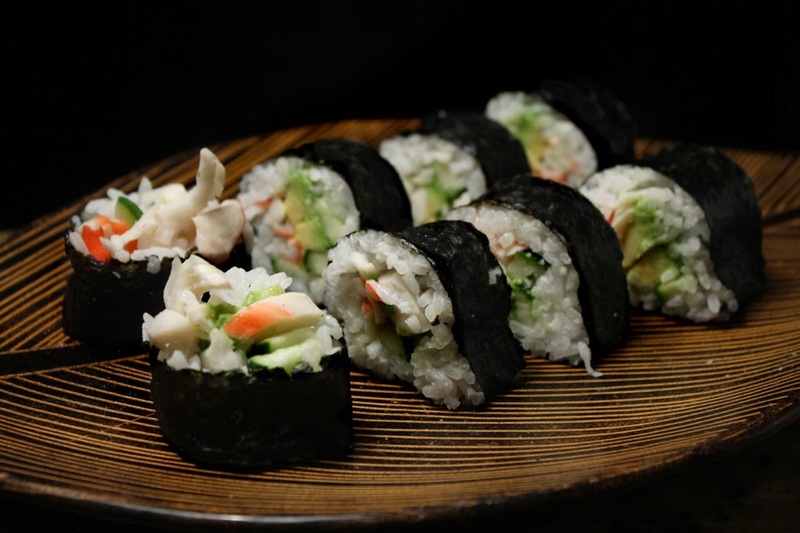 So, with an 8 ounce package of krab, you will get about 4 large sushi rolls with this recipe. And when you cut each roll into 8 slices, that makes 32 pieces! 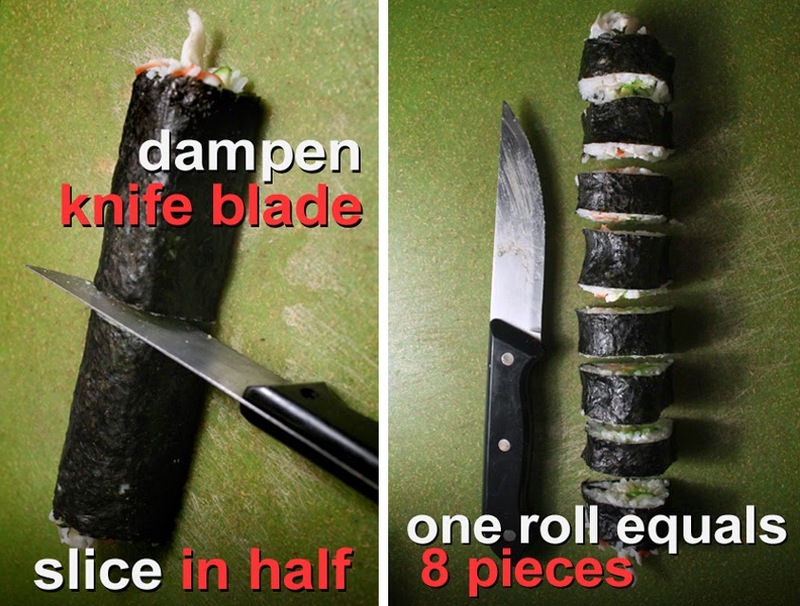 It's also an inexpensive way to get your sushi rolling skills up to speed. 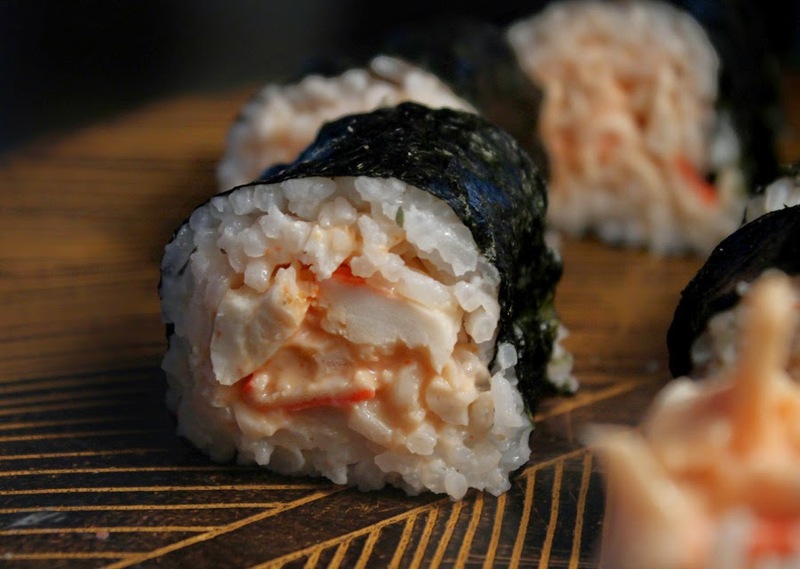 If you haven't made a sushi roll before, I recommend starting out with my cheap$kate Spicy Krab Roll. My first rolls were lopsided and often not tight enough, so when sliced the rice would halfway fall out. Or, I would forget to dampen the knife blade before slicing, and the roll would squash and the seaweed would tear unevenly. Oh well, you gotta ruin a few sushi rolls when you start -- but, in no time I quickly got the hang of it. Plus, the mistakes were still deliciously edible. 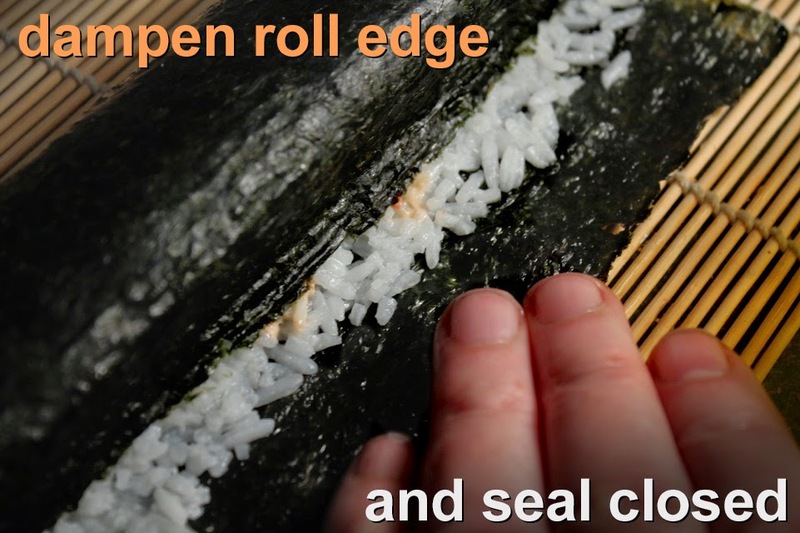 Here is a GIF of me hand-rolling a California Roll. As you see at the end, it's a little lumpy. To smooth it out just give the roll a final squeeze with a bamboo rolling mat. Click here to see the video. And in this GIF I use a sushi mat. Click here to see how cheap it is to get a sushi mat online (less than $3 and you can get them at larger chain grocery stores, too.) 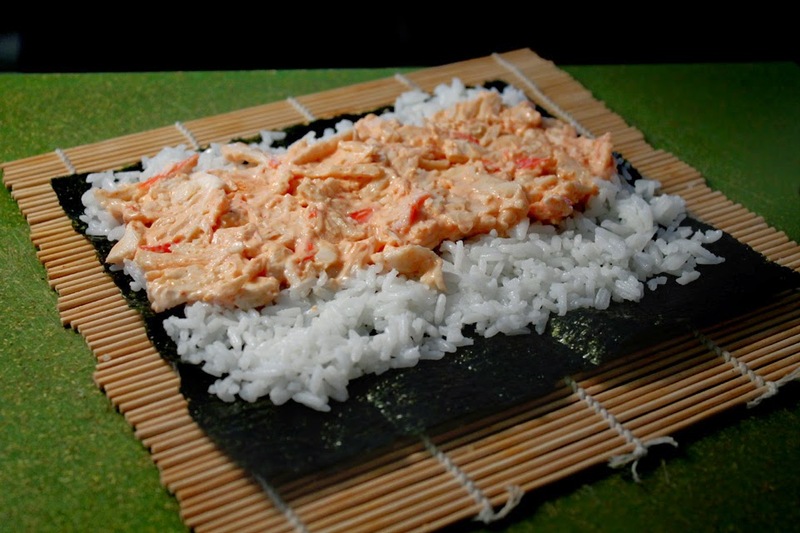 For a video of sushi mat rolling, click here to see my Spicy Tuna Roll recipe. 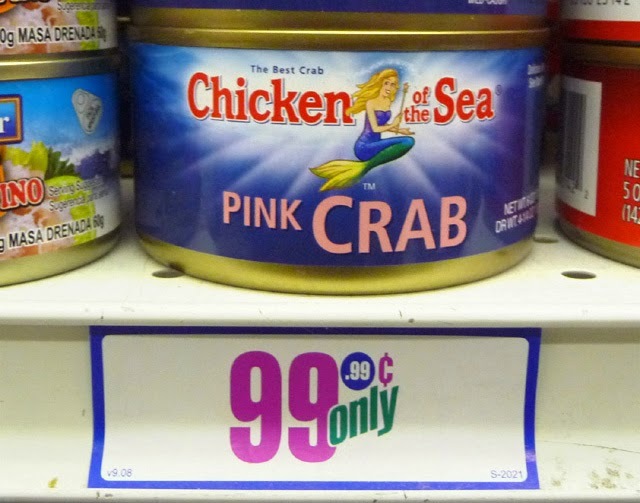 I get a half pound of krab for 99.99 cents at my local 99c only Store, and even at a regular seafood market krab is about half the price of any other seafood. The quality of krab can vary, sometimes it's a little dried out and stringy, while other times it's perfectly moist and sweet. An easy way to reconstitute dried and stringy krab is to sprinkle it with water and zap it in the microwave for about 30 seconds until soft and warm - it works quite well. 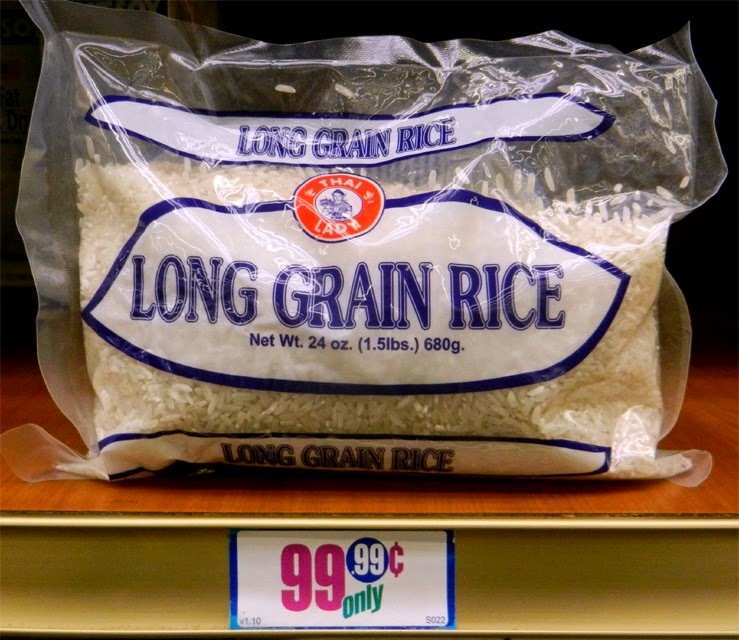 Regular white rice is cheap. Most sushi recipes call for special (meaning expensive) sushi grade rice -- well, don't believe the hype. Any type of white rice will do fine, and you can make it with more expensive and nutritious brown rice. It's mainly about how you cook the rice, not the grade of rice. Under Directions below, I have a link to my Sushi Rice recipe video. 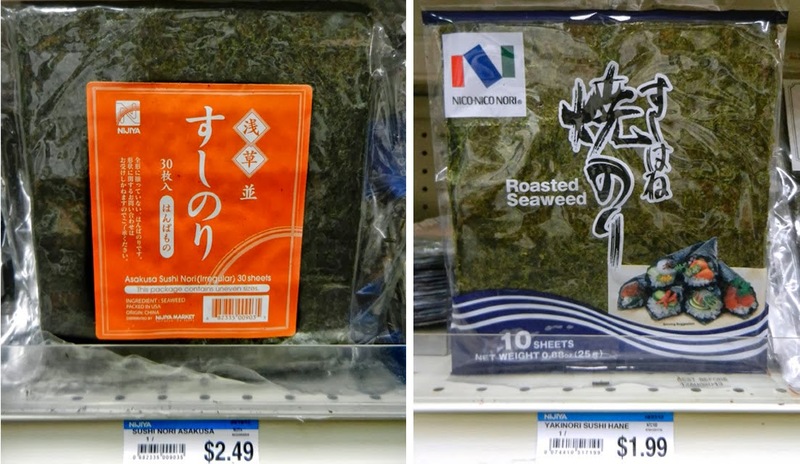 The only tricky ingredient to find are sheets of dried seaweed, called Nori, but even that is easier to purchase these days at larger chain grocery stores. And if you live near an Oriental market, then that is the cheapest place to get it. 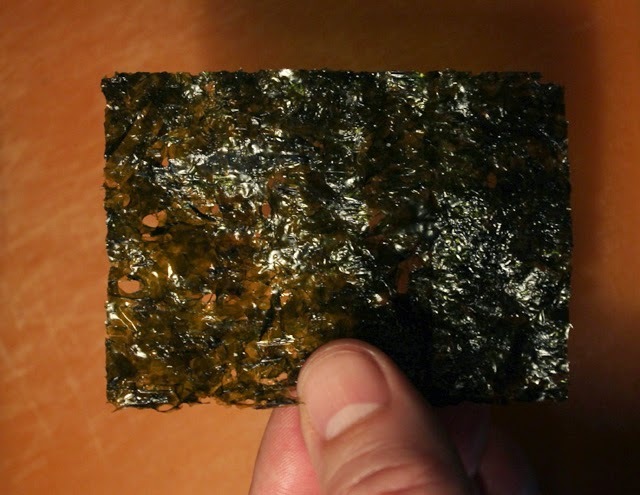 Dried seaweed for sushi rolls are about the size of a sheet of computer printing paper (8 inches by 7 inches.) They usually come 10 to 30 sheets per package. A sheet of seaweed seems brittle, but when cooked damp rice is added, it becomes soft - malleable and easy to roll. If you've been following my Sushi Series, then add this to your repertoire. 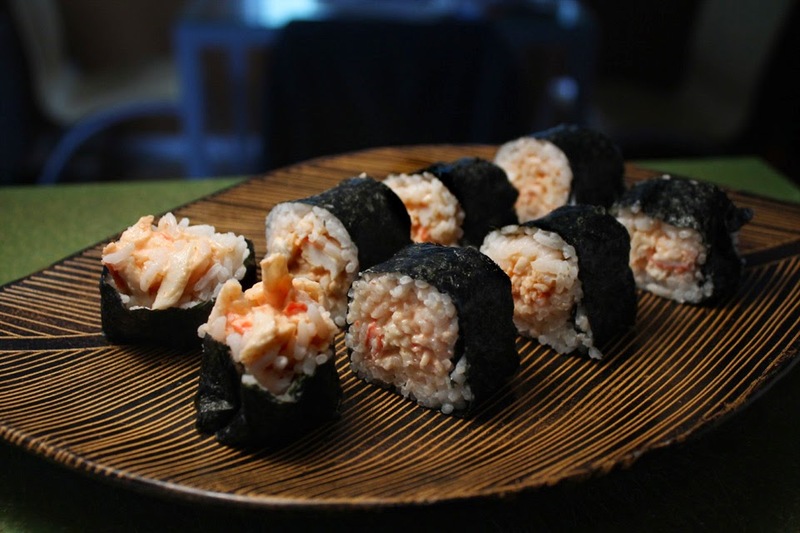 If you are new visitor, then a Spicy Krab Roll is a perfect cheap$kate sushi recipe to start with. 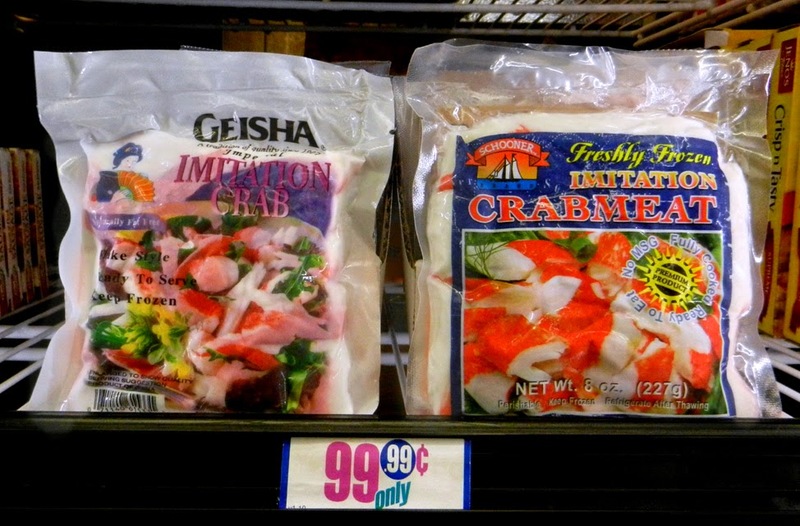 8 ounces krab - roughly shred or pulled apart. If frozen then defrost first. 2 to 3 tablespoons of mayo - more or less to your own taste. You want enough to mix into krab until it's as creamy as a macaroni or potato salad. 1 teaspoon hot sauce - I used Sirracha Chilli Sauce. You can also use any favorite hot sauce, or a pinch of ceyanne pepper. Add a little at a time to reach your own desired spicyness. You could just leave it out completely for a sweet Krab Roll. 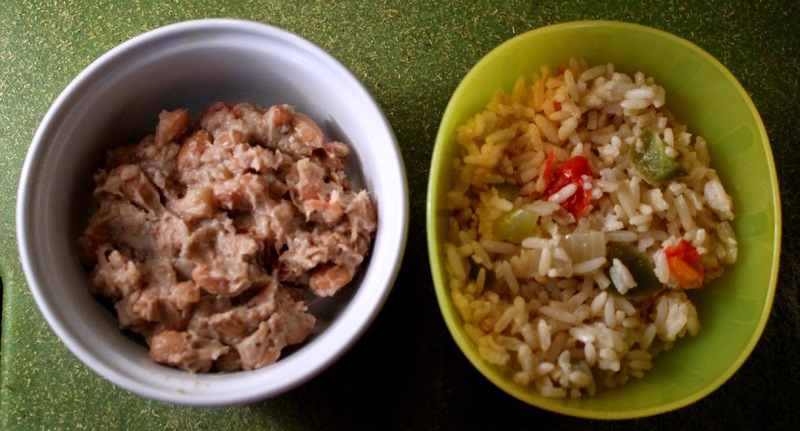 2 cups of cooked Sushi Rice - my recipe is a click away, here. 4 sheets of dried seaweed - depending on how much spicy krab you stuff into sushi rolls. Prepare Sushi Rice according to my recipe, click here for details. The rice should be room temperature when making sushi. 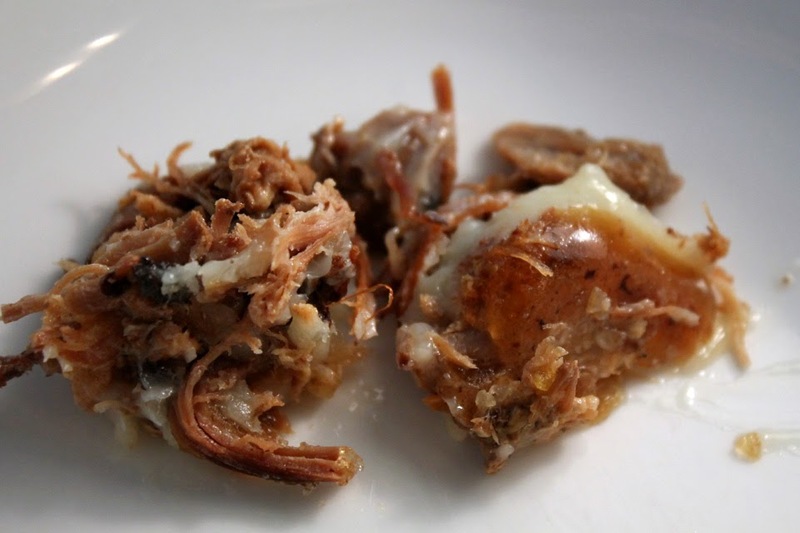 Roughly shred, or pull apart, krab pieces. Taste a piece and see if you need to soften it -- by microwaving. An easy way to reconstitute, after defrosting, is to sprinkle on a little water, loosely cover, and do a 30 second micorwave (take out pieces as they get warm and soft, and continue to zap in 10 second increments, if krab pieces are still cool.) The krab will soften and plump up perfectly. Finally do a rough chop (or hand-shred) and mix it with the some Spicy Mayo. 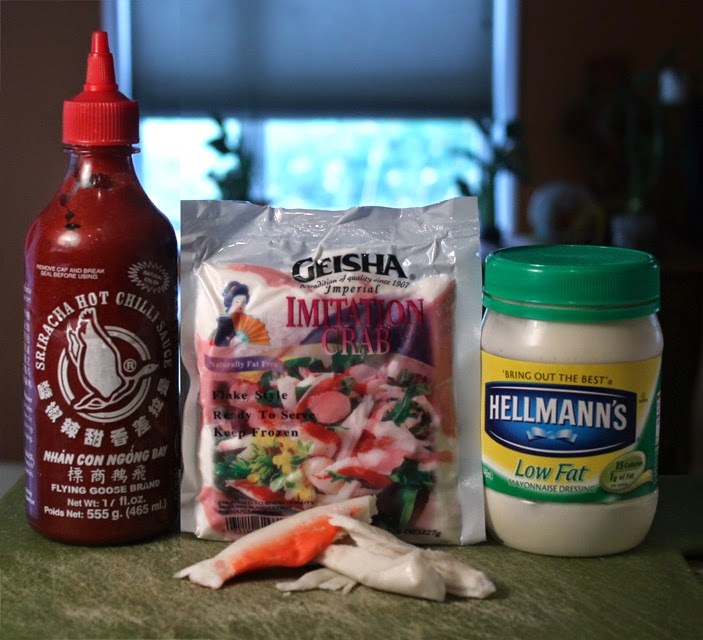 Mix mayo and Sirracha Chilli Sauce (or favorite hot sauce) in a bowl. Mix shredded krab and spicy mayo in a bowl. If necessary, cover and store in refrigerator until ready to use. Now time to bring it all together. You can use a bamboo sushi mat or just roll it up with your fingers. It's easier to use a mat, but now I just do it by hand. 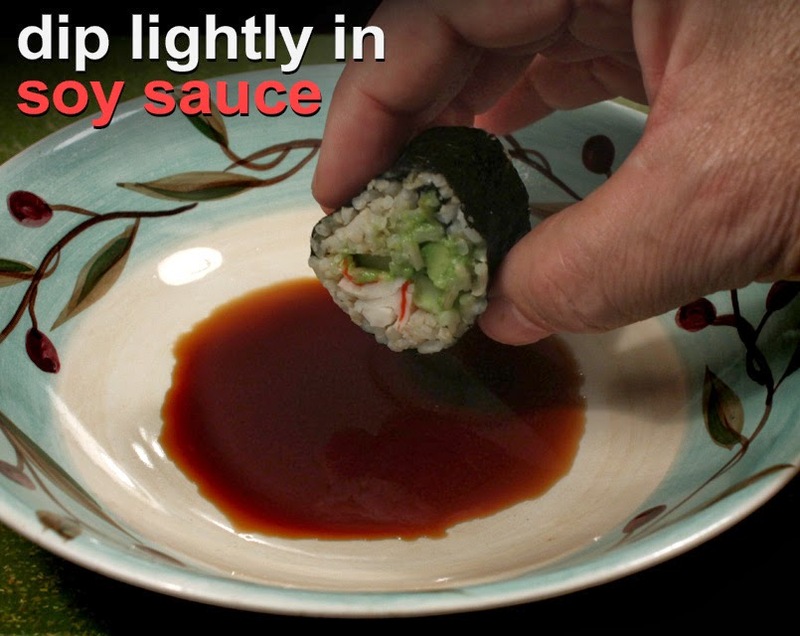 If you do it by hand then keep your fingers dry and tighten it up at the end, if needed, with a sushi mat. 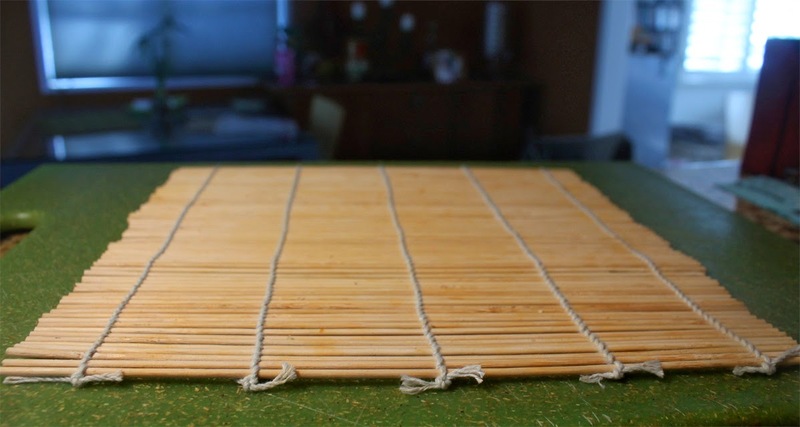 If using a bamboo sushi mat lay it out on a dry surface. (Dried seaweed is very absorbent and sticky when wet.) Place one whole dried sheet of seaweed on center of sushi mat. 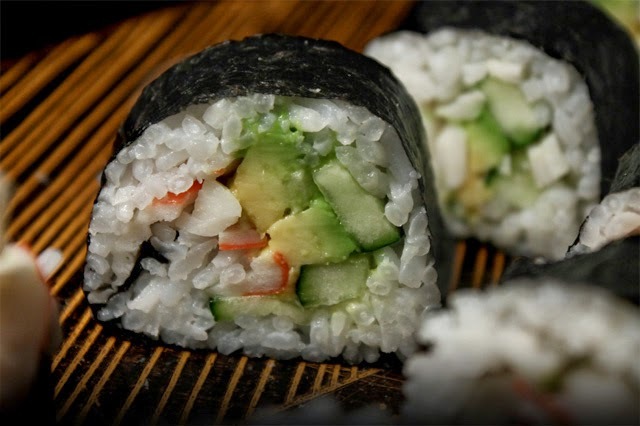 Now dampen your hands (as Sushi Rice is sticky and water will make handling easier,) and spread out an even layer of cooked rice over the dried seaweed. You will be rolling sushi, so leave a half inch edge empty of rice. You can cover all the seaweed, on right and left sides, with rice. As for how much rice you pile on, it's up to you. I just do enough until you can't see the seaweed underneath -- about a 1/4 inch deep. 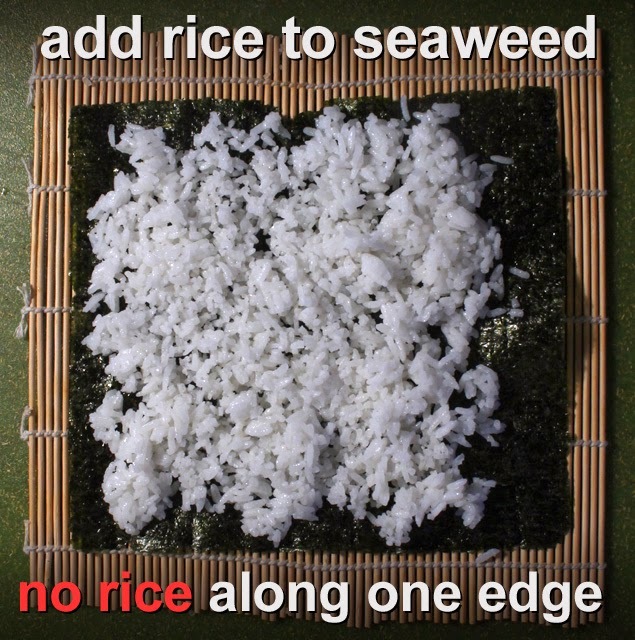 When seaweed is covered with rice (except half an inch along one edge) gently press on the rice with damp fingers, so it's spread evenly across the seaweed. Now you can pile on the spicy krab. Cover about a quarter to a third of the rice with spicy krab. I spread it across the center area, end to end. You can use a lot of spicy krab or just a little - it's up to you. Now time to roll it up. You can rotate the mat away from you to roll, or keep it facing you. 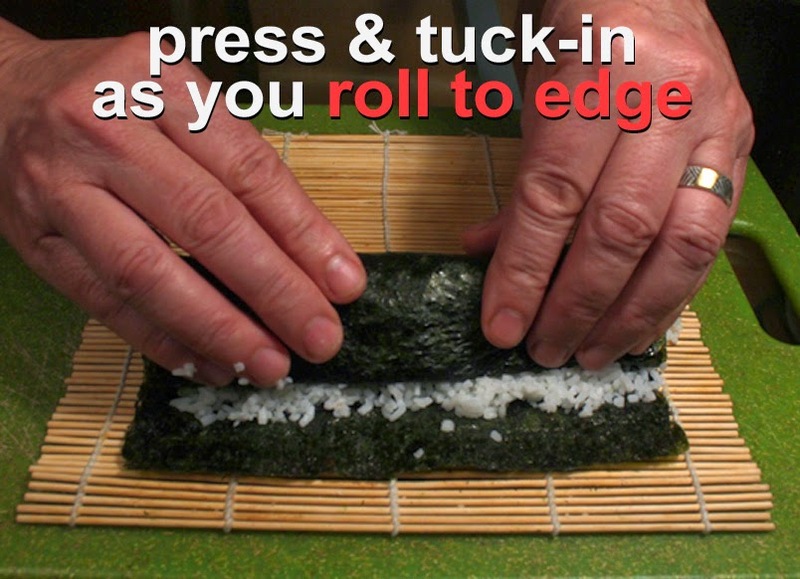 Roll the loaded seaweed with a medium pressure as you go, tightening the roll. Keep rolling and adding pressure until you reach the half inch of clear seaweed at the end. 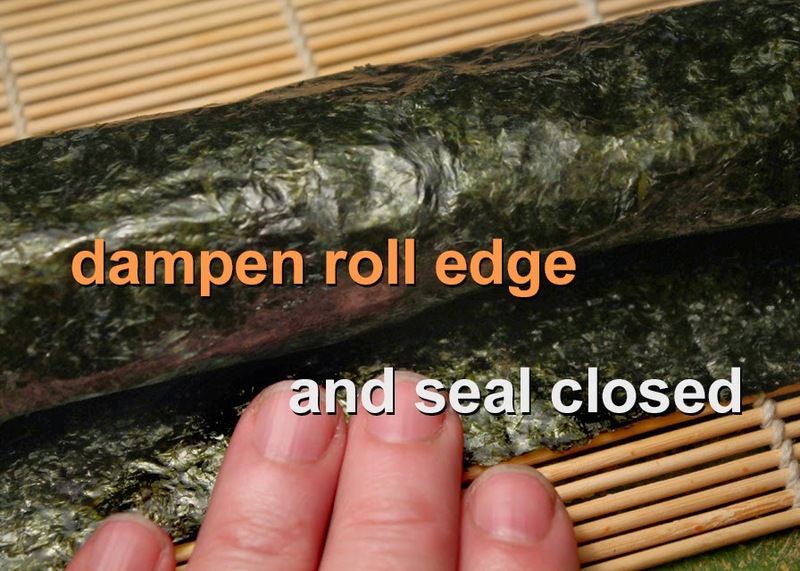 Dampen your fingers and moisten the seaweed edge and just press together to seal. Once the roll is sealed, wrap the roll one more time in the mat and give the roll even squeezes from end to end. This will help keep the roll from falling apart when you finally slice it. Remove the mat and place the whole Spicy Krab Roll on a cutting surface. Take a sharp knife and dampen the blade with water. I start in the middle and slice in half. Then I slice each half into 4 pieces, so I get 8 slices per roll, total. You can make thicker pieces if you like, to get 6 pieces total. The object is to make each piece edible in one bite. You can eat the sushi as is, or pour a small plate of soy sauce and dip sushi pieces as you eat them. 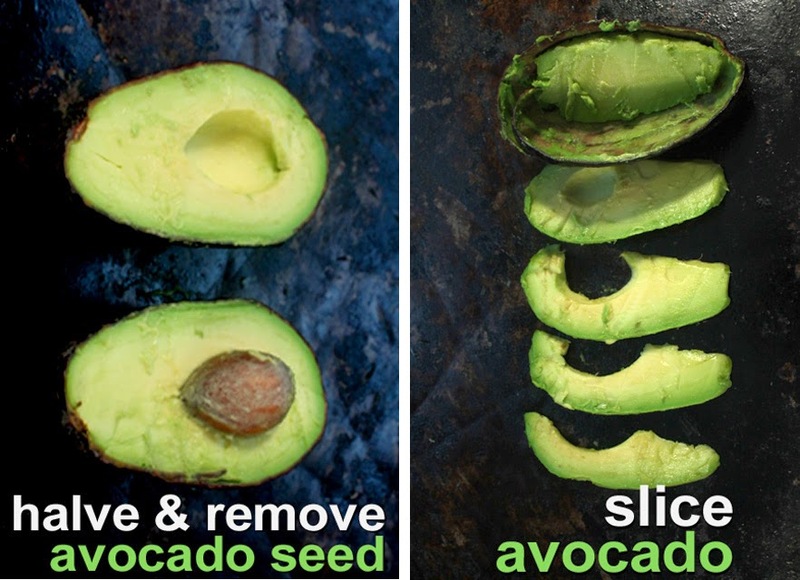 1 large avocado - slice the flesh. 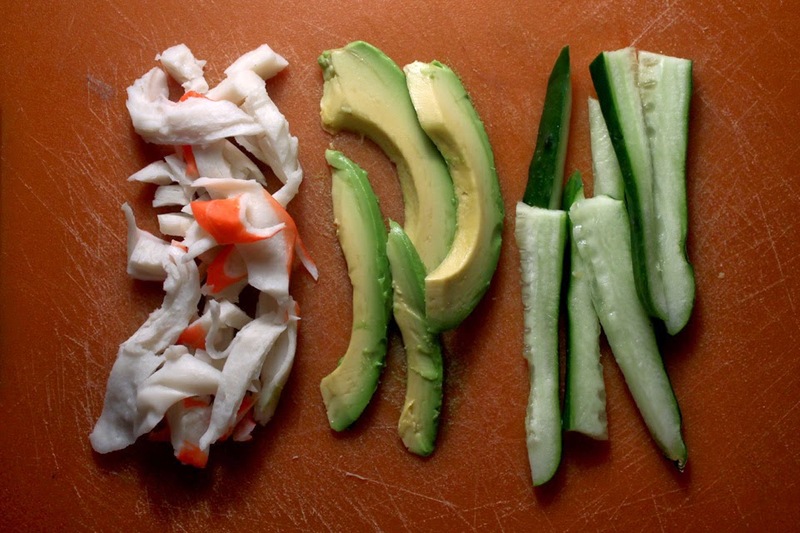 Making a sushi roll takes a little practice. Sometimes the sushi roll is thin, or too fat. But it's easy enough to open the roll and add or subtract filling before you seal it. Here's my GIF of rolling with a bamboo sushi mat.